If anyone has additional suggestions, please post, and I'll edit the original posting. Please post screenshots of your attempts! Good luck, and have fun! P.S. 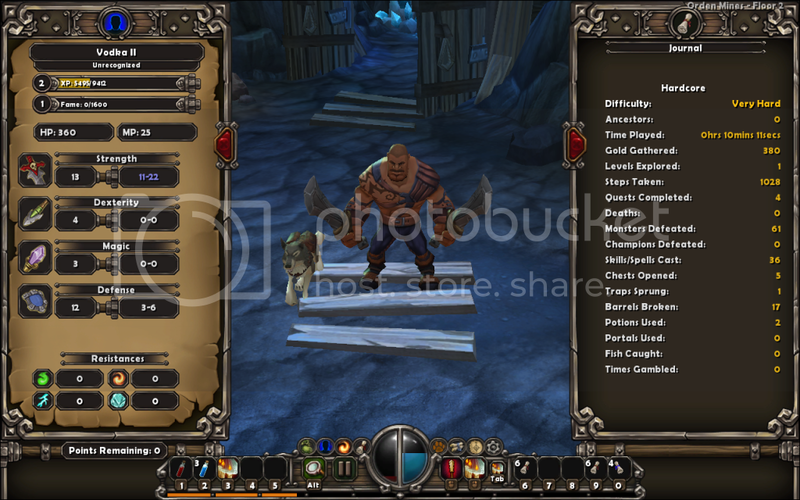 Screenshot instructions: shift-F9 takes an image, then you can go to C:\Documents and Settings\Chris\Application Data\runic games\torchlight\screenshots to find the files. Just paste that into Start -> Run. ImageShack has an "Uploader" program that makes it easy to upload and link multiple images simultaneously. I came to Torchlight in search of battle and wealth, but quietly, I also hoped that defending this small border town would bring me a lasting sense of peace. I've always traveled, but Torchlight is somewhere I could put down roots, set up a small farm, and live out my days in solitude. I've arrived at the second level of the mine, and as I'm beset upon by these twisted visions of Ember, I can feel the power of my ancestors rising up to protect me. This force is so vindictive that, on occasion, I have seen it reach out from the nether-realms to strike at my foes in the living world. Before long, I came to a large, cavernous room, covered in the goo of what must have been several hundred rotted creatures. At the center of the room reclined a massive arachnid, pregnant with the blood of her victims, larger even than those in legends. Almost made it to level 5 that time... might have to think of some way to make this more viable. I prefer to play SC ironman and it's a lot more possible with the traveling vendor-pet. I kind of blew it after my first rerun after Retirement because I was finding 0 pots and getting murdered. Is SC ironman still an ironman? I thought the main ideas were total self-sufficiency and that it ends if you die. In fact, it's pointless. Even with good drops, it's an endless kite-athon of epic proportions which ends when you run out of potions. Or patience. Kiting mobs with shadow armour (start running after it starts swinging) and hit-and-run with slash is not fun, even when a few strategically placed health/mana shrines, and some less-than-abysmal drops help you out. Probably should've opted for something other than the imaginary pet, too. I edited the original post regarding TNT barrels (not required; this is hard enough). 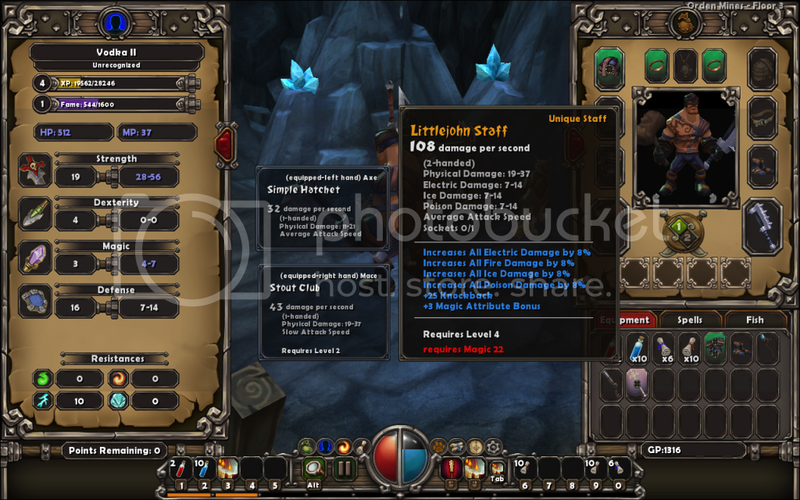 I also posted that you should use your original 100g to buy 3x Health Potions, which should help alleviate some of the kitefest early on. Ok. I did buy in town (and even sold my two TP for that purpose), initial purchases were always a part of Diablo Ironman (though that was co-op, so you'd stock up on resurrect scroll), so I thought that was ok..
I`ll most likely pick this up when I get a new PC (and can finally play the game flawlessly) in a week or two. Got to 7, nice gear, plenty of potions stocked up... then insta-gibbed in a phase portal by archers. Was doing so nicely... oh, well. It's definitely harder than D2 HC. What were your stats and skill distribution? I`ve found the game to be pretty easy if I add (almost) all stats do defense and upgrade only Shadow Armor early on up to lvl 5 (the damage it deals helps a ton). But I haven`t gone much further on VHHC - the giant 5th level lags like **** on my ancient PC. Although I guess that a phase portal so early (and not only) is a real killer no matter what skills/stats you have :? If not for that phase portal, I would have been in very good shape. I had about 5 of each potion, and I was killing things without much hassle. Brink was really hard, though -- I probably used about 8 healing and 5 mana potions. Starting to think the poster above me might have the right idea about Shadow Armor -- once in a while it lands a big crit, but for the most part, the damage **** and the block is too low to make a significant difference. Killed Brink, took a while... now clvl 6 and dlvl 5, found some really nice stuff, and, most importantly, found Heal Self 1. Major boost right there. As far as skills go, Entropic Aura is great, as slower enemies = easier hit and run. I tried this, got swarmed by mobs in the begining of the second level, I used up all but one of my potions just to survive. Had an unique pistol drop from a boss, which I obviously didn't use. Tried to save my last healing potion for the last second, but I screwed it up and died. I think the best case scenario would be me killed by Brink. I didn't get very far, but I think that Shadow Armor is the way to go. Extra points spent on Slash seems a bit of a waste for me. On the other hand Shadow armor's extra block will be useful in a long run. If I ever get to lvl5 I will be improving Titan Stomp for a while. Actually I was wondering about Shadow Bowman at lvl10 (lol). I don't have any experience about the damage of this skill, but the fact that its ranged looks promising. Oh, and I got a question: So far I thought that the game saves when I go to town. How does saving works exactly? Or part of the contest is to do the whole game at once? I believe it also saves when you exit to title, or when you go into a portal. I don't see the appeal of block early on, not only is the % chance fairly low, but you're also unlikely to get hit in the first place. Smooth sailing for my guy now, more so due to the 2 decent weapons than due to healing, which'll probably come into its own in a couple of lvls when I can no longer reliably kill stuff without taking damage. Can I ask how you killed Brink? I reached him on my second try, but the only way I found to damage him without constantly using health pots is to circle around that obstacle part of the map, changing directions and waiting for my pet to hit him once or twice before he starts to focus on him and sends him to flee again. Killing him like that takes a LOT of time... Actually I died again because of the exploding crystals, but those can be avoided or destoryed. If I were to fight face to face with him I'd have needed about 15-20 potions (I tried this for a while, but gave up after about 3 pots, coz I didn't believe my 13 will last). Maybe I didn't find weapons good enough. Both of them were 60-70 DPS if I remember correctly. Still, I believe that the Shadow armor's damage is greater then the extra damage for lvl4 slash instead of lvl1. Glancing blows to normal monsters are very rare, and often my armor hits more than I do. However its value against Brink is questionable. Also I was wondering... Two of the three (i think) bosses I met before Brink were those big rats with hammers. I can't hit them without getting hit, so I had to waste about 2 potions for each of them. Actually I can't even kill the normal version of those without getting hit once or twice, I'm lucky that they are kind of rare. Is there a trick I don't know about? As for Brink, I just used Slash Attack and Titan Stomp, and tried to stay out of his way as much as possible. Basically I ended up just going head-to-head, though, and sucking down my store of around 8-10 potions. Same idea with rat bosses -- they're going to hit you either way, so the best you can do is kill them ASAP. Hit-and-run is the way to go. Brink is easily (read: takes forever and a day, but is fairly safe) killed with TS spam, as that hits through most obstacles and allows you to stay out of harms way. Going up close in Ironman would depend on the weapons you have - witht he weapons I found shortly after brink, I probably could've trashed him in a 2-3 pots (I actually found the shiv in one of the chests in the arena, but couldn't have used it at clvl 5 anyways), with what I had (2x 60 pds), even a full slash critical didn't yield enough of a damage increase over the ts spam (30-40 vs 80-ish) to justify the extra risk. It takes a lot of clicking, as you'll be on the move almost constantly, but it keeps you from getting hit about 90% of the time. Still, I believe that the Shadow armor's damage is greater then the extra damage for lvl4 slash instead of lvl1. Edit: Here's a pic to illustrate how to best take advantage of TS and obstacles. I'm going to give this ironman challenge a shot. I think I'll start with a Destroyer. I didn't find a single usable magic item, health potion, ranged weapon, better melee weapon on the first 1 and a half floors. Thanks to the efforts of two varkolin mages and a pile of those spiders I'm down to a tiny fraction of health and no potions already. Since I have no ranged weapons to kite with, this journey is looking fairly doomed. And was promptly cornered and burnt, sliced, etc. to pieces, despite spamming Titan Stomp and both potions. ****, that's rough, man! 108 and +25 knockback at level 4... that would be so brutal... practically a free ride to 10+. Yup, sadly I didn't end up getting a single decent weapon for my destroyer. Vodka II died just now, after I killed Brink I went down the stairs and was immidiately raped by a champion spectre and a dozen skeletons... I'll give it another go shortly. btw, are dungeon merchants allowed? ****, that ****... I'm about to try another, too. Good luck!